A taxpayer has the right to a collection due process hearing with the Internal Revenue Service Appeals Office under certain circumstances. This hearing can be very beneficial to a taxpayer in terms of preventing enforcement action such as a bank levy or wage garnishment and by a means to establish or propose an agreement with the IRS such as an installment agreement or offer in compromise. The video below has been prepared to provide information as to when a taxpayer may be able to request a collection due process hearing. If you are experiencing any issues with the IRS, you can speak with a tax attorney, by contacting The McGuire Law Firm. As a tax attorney John McGuire has assisted many individual and business taxpayers before the IRS, including via collection due process hearings with the IRS Appeals Office. What are my rights as a taxpayer? What appeal rights do I have regarding IRS actions or decisions? These are common questions a taxpayer may have when a tax liability is owed to the IRS and the taxpayer is in the collection process with the IRS. The information below has been provided for general information purposes. If you owe taxes to the IRS and/or the IRS is attempting to collect the tax liability, it is highly recommend you speak with a tax attorney regarding a resolution to the matter. Many IRS collection actions can be appealed to the IRS Appeals Office. The appeals office is a separate office from IRS collections and is supposed to make independent decisions apart from IRS collections. You can review Revenue Procedure 2012-18, which provides more in depth information regarding the IRS appeals’ office independence from collection. The appeals office follows two main procedures regarding appeal action. These two procedures would be Collection Due Process (often referred to as CDP) and Collection Appeals Program (CAP). A Collection Appeals Program (CAP Appeal) will generally result in a quicker appeals decision and as stated above is available for somewhat of a broader set of circumstances. However, one should not that you cannot go to court after the CAP Appeal if you disagree with the CAP decision. Can I represent myself? This is a common question, and yes, just like in any court matter you can represent yourself, but you may want to consider speaking with a tax attorney if you are not experienced in IRS procedure and tax law. You can also be represented by a family member, or if you are business, a full time employee can represent the business or partners and/or officers of a business can represent the business. The above article has been prepared by John McGuire of The McGuire Law Firm. Mr. McGuire’s practice focuses primarily in taxation, including the representation of both individual and business taxpayers before the IRS. The article below has been prepared to act as an IRS Offer in Compromise resource page whereby individuals can obtain necessary information regarding an IRS Offer in Compromise. Please note, this information is not legal advice and should not supplement the advice of a tax attorney or tax professional. An offer in compromise allows a taxpayer to settle their tax debt with the Internal Revenue Service for less than the total amount of tax owed. Generally, the IRS will accept an offer in compromise if the offered amount by the taxpayer is the most the IRS could collect from the taxpayer within a certain period of time. The IRS has an Offer in Compromise Pre Qualifier tool that can be very useful to taxpayers wondering if they would be eligible for an IRS Offer in Compromise. The pre qualifier tool initially asks the taxpayer questions related to tax return filings, estimated payments and other tax payment & filing issues as well as bankruptcy (click for initial questions). These issues could dictated whether or not a taxpayer is even eligible to submit an IRS Offer in Compromise. Thereafter, the Offer in Compromise Pre Qualifier Tool asks financial questions related to income, expenses, assets, asset values and loans. These financial questions break down a taxpayer’s equity in assets and disposable income which are the major factors considered by the IRS when accepting or rejecting an offer in compromise. 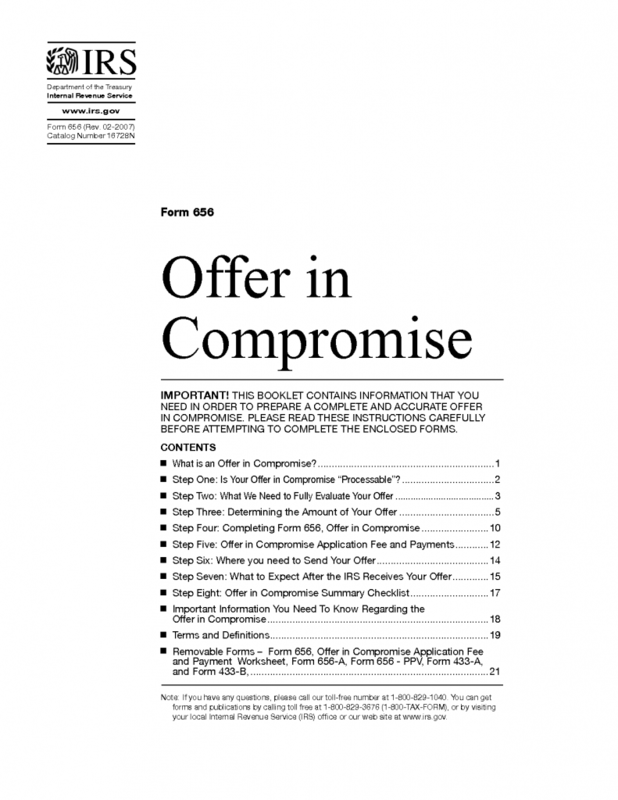 Form 656 is the form submitted to the IRS when submitting your offer in compromise. Form 656 states the taxpayer’s information, the tax types and periods of which the taxpayer is attempting to settle, and perhaps most importantly, the offer in compromise amount and terms for payment. In addition to Form 656, the taxpayer must submit the proper financial statement. An individual taxpayer will submit Form 433A OIC, and a business taxpayer will submit Form 433B OIC. If an individual has ownership interests in a business, the individual would likely need to file Form 433B for such business. Your offer will initially be submitted to one of two offer in compromise units, which are in Memphis, TN and Holtsville, NY. Where you live, will determine the office where you will file your offer. The offer in compromise booklet provides the correct address based upon where you live. What Decisions can the IRS make regarding my Offer? The IRS can either accept, reject or return your offer. Acceptance, of course would be preferred! If the IRS rejects your offer, they may reject the amount, but agree to a larger amount and thus you may still be able to settle your tax debt. You can also appeal the rejection by filing Form 13711. The IRS will return an offer if, for example, the taxpayer is out of compliance. You do not have appeal rights on a returned offer. 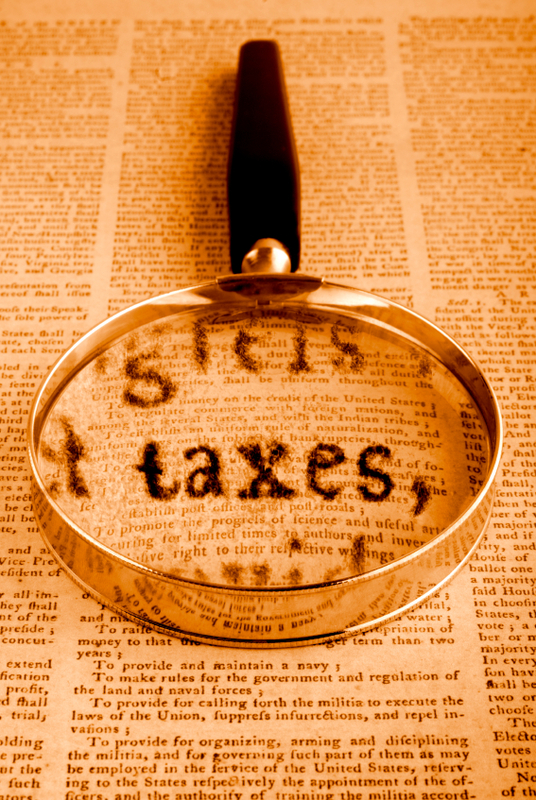 The IRS does make certain information regarding offers public. Click, “information” for addresses of IRS offices with information open to public inspection. IRS Publication 594 discusses the IRS collection process and may be useful to you as you are considering submitting an offer in compromise to the IRS. 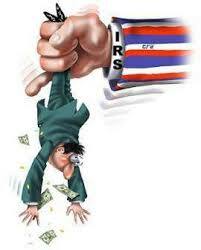 Generally, submitting an offer to the IRS acts as a hold on enforcement. If you have questions regarding the IRS Offer in Compromise process or your ability to settle a tax debt, you can discuss these issues with a tax attorney at The McGuire Law Firm. A free consultation is provided to all clients. Taxpayers may receive a IRS Supporting Document Request from the Internal Revenue Service requesting supporting documents for certain items, issues or positions taken on a tax return. 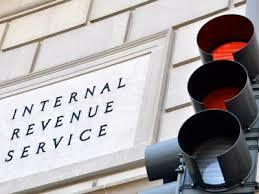 Common issues of which the IRS would request a taxpayer support could be IRS Filing Status. For example, if a taxpayer filed head of household, the IRS may want documentation to verify the dependent and elements that allow a taxpayer to claim head of household. Furthermore, a common document request by the IRS is to verify children and the related elements that are necessary to claim certain tax credits. Generally the taxpayer can compile the necessary records and documents, and forward to the Internal Revenue Service via mail and the document request is not necessarily an audit whereby the taxpayer would meet with an examiner. If the taxpayer after reviewing the necessary requirements and elements realizes they should not have claimed a certain filing status or taken a specific position on the tax return, they can agree with an assessment of tax that would have occurred had the taxpayer not claimed a certain status, dependent, related credit or other issue. The video below has been prepared a tax attorney at The McGuire Law Firm Denver Tax Attorney to provide additional information regarding the IRS requesting additional documents to support positions taken on a tax return. What is the Offshore Voluntary Disclosure Program? Often referred to as the OVDP, this program was created to allow taxpayers with foreign financial accounts and interests to voluntarily disclose their interests for a reduced penalty. Currently the foreign bank reporting requirements require that taxpayers with foreign financial accounts or interests report these interests when the aggregate amount in the accounts exceeds a certain threshold, which is currently $10,000. This is often referred to as the FBAR. When taxpayers fail to report such interests, penalties can be assessed by the Internal Revenue Service. Thus the OVDP provides a means for taxpayers to be in compliance with the FBAR requirements, and reduce penalties that would apply if they do not voluntarily disclose and are eventually caught by the Internal Revenue Service. John McGuire is a tax attorney in Denver, Colorado with The McGuire Law Firm and has prepared the video below to provide additional information regarding the Offshore Voluntary Disclosure Program. 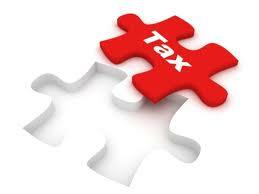 You can speak with a tax attorney by contacting The McGuire Law Firm and schedule a consultation.